Ребят! я что-то не понимаю. А что на SCANIO, сошолся клин. Почему таких модов нет на DAF,VOLVO,и т.д.почему модостроители не могут сделать , либо общий мод, либо для каждой модели?Почиму я любитель DAF-а, должен слюньки глатать? can you use another download page ? Where is read “KALSA YOU MUST USE THIS”? 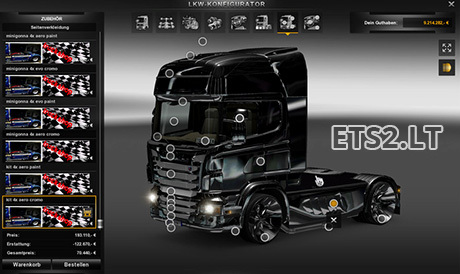 are you only person whole world who play ets2 ? maybe someone else like this so if that is your only opinion, just be quiet! dont bother write here!!! where is your mods??? But the title says v8.0 and the description says v2.0. That’s what you get when everybody uses the same names for their mods. I have to deactivate the old version 7 and Add-On 7.1??? Maghetto704 , для DAF, когда ожидать , подобный мод? Many skins eh?? I only got 2 and its the vigil du fuco and the other one. I guess two is considered many skins these days..
Is there anyway that someone can upgrade this mod to work on 1.4. Loved this mod with the lowered suspension and the LED lights that were available. Make the trucks look much nicer. Here, the mod is 91mb, but when i press the download button it’s size just 33 mb…where is the right one? would﻿ it work with 1.5.2s ??? Doesn’t work on 1.6.1s, in which is disappointing. This was quite easily my personal favourite mod. Any chance someone can do an update on the mod? This mod does not woeks in new version 1.11.s many parts of trucks render in red parts all over the truck. I had to remove the mod. This mod worked well up to version 1.19.24. I have the 1.16.2 patch for Euro Truck Simulator 2 and I tried all versions of Truck Shop on my Scania R but each time put a chassis Truck Shop it turns red. I’m changing all other parts of the truck but it is still red. Then there was there a specific version of Truck Shop in 1.16.2 patch? or should I do something else? update the mod for 1.23.x.x and future versions of the game?